The Delta-flagged jet that ended up in a ditch today wasn't a prank but, instead, an attempt by a fugitive wanted in connection with a murder who managed to break into the plane and managed to pilot it as far as the parking lot before crashing. He reportedly committed suicide in the cabin when the attempt was unsuccessful. 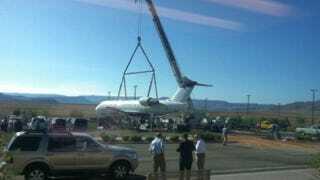 When pictures of the SkyWest jet in the ditch outside St. George airport first emerged we were unsure what to think, but NYC Avaition floated an interesting theory that someone may have tried to steal it given the location and damage. According to ABC 4 News, the person in the plane was a fugitive wanted on state chargers who "attempted to steal a plane, didn't get airborne and committed suicide." This would explain the FBI and authorities shutting down the airport today. But how does someone get into a plane and start it up at 3 AM in the first place? Right now we have more questions than answers. UPDATE (14:13 EST) They're now identifying the attempted pilot as Brian Joseph Hedglin (pictured to the left), who was wanted in connection to a murder in Colorado Springs. The man reportedly has a pilot's license and hopped the fence of the airport to get onto the tarmac and steal the plane. This makes sense given the airport's proximity to Colorado.